I wanted to show you my Mom’s beautiful clematis that welcomes friends to their home in Victoria. 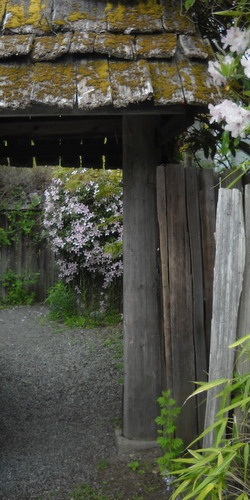 My Dad built this fence years ago from cedar he split from the beach. In the years since, this lovely clematis has taken over. Mom used some of this clematis and lots of other flowers from her garden, in the arrangements she made for my wedding years ago. This particular clematis has a wonderful scent and now it is synonymous with our wedding. I have started one of these plants on our own garden gate and it is very happy and productive there. Since I started partygreen celebrations, I have been thinking more and more about putting into words “the why”. I know that it about reasons such as this clematis…it is about having a connection to the earth. An appreciation for the gifts that a garden can give us seasonally–the scents, the visual beauty and the strong memory of a fondly remembered celebration. Do you have a fond memory of a celebration that the scent of a certain flower evokes?